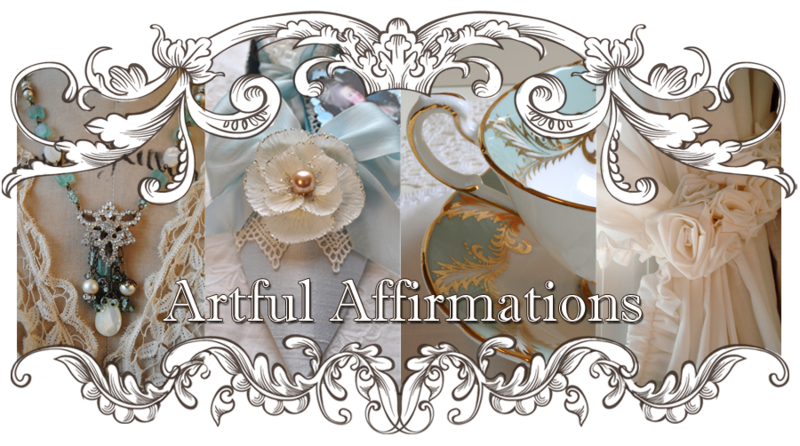 Artful Affirmations: Mixed Media Fun! That is darling! I love fairies and gnomes. We just put the gnomes out in our garden today! I hope you are having a good week. Terri you amaze me at every turn with your talents. Whomever receives this is truly one lucky gal. This is just beautiful! You have succeeded in creating a little world. I am so in love with this. What wonderful attention to detail. You have inspired me to try my hand at creating something like this. This is simply amazing! It is beautiful and artistic! Standing ovation from me!!!! BRAVO!!!! What a work of art! 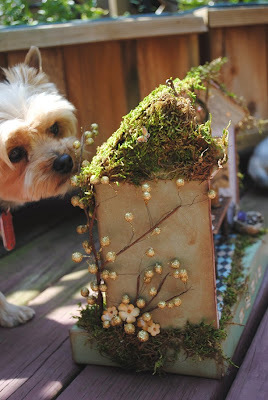 Adorable fairy school, So sweet your dog is so interested in it also! This is truly wonderful! The details are incredible...you are so talented! That is ABSOLUTELY gorgeous - do you have any objection to my posting a pic from here and a link to your blog on my blog www.makeminemini.blogspot.com? 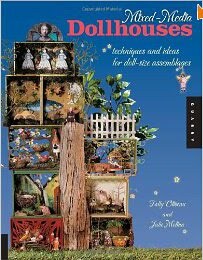 I know that there will be lots of miniaturists who would love this! My goodness! This is wonderful! What talent! I do love the whimsy of the whole thing. Takes my breath away. 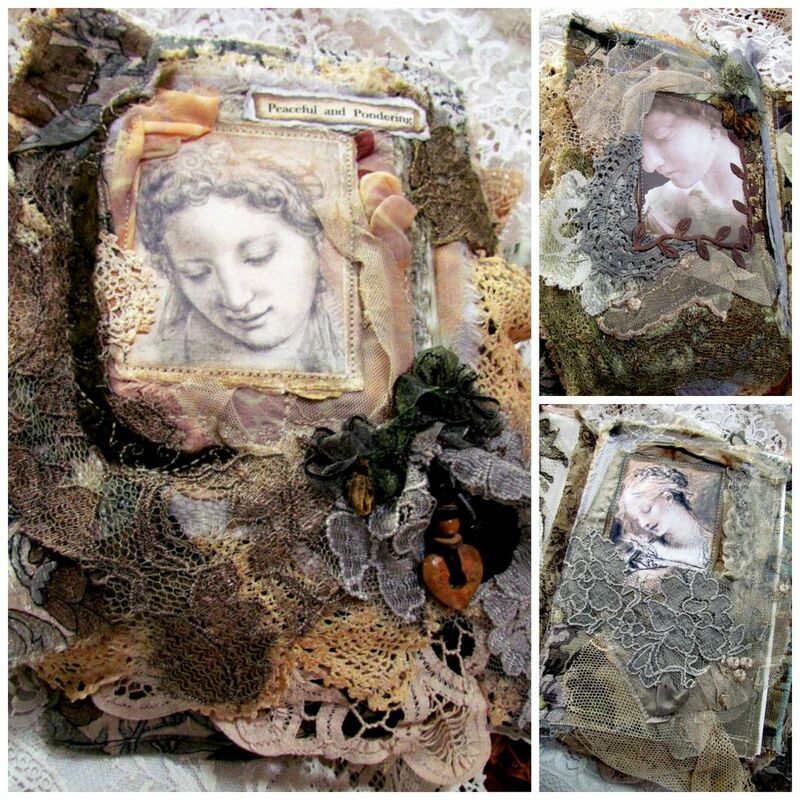 Oh my goodness Terri how wonderful your mixed media piece is!! It is a delight to look at... such wonderful detail and so much of it to see. Thanks so much for sharing it with us AND also for your Birthday wishes... it meant a lot. Terri, what a beautiful little school house you have created! I love everything that is happening in there. Your work is amazing and you are so very talented.Glad to see you are creating. I got the book on pre-order and haven't even looked at it, just a quick turn the page, one of these years I will get there. Betsy & Emma look like they are very happy. 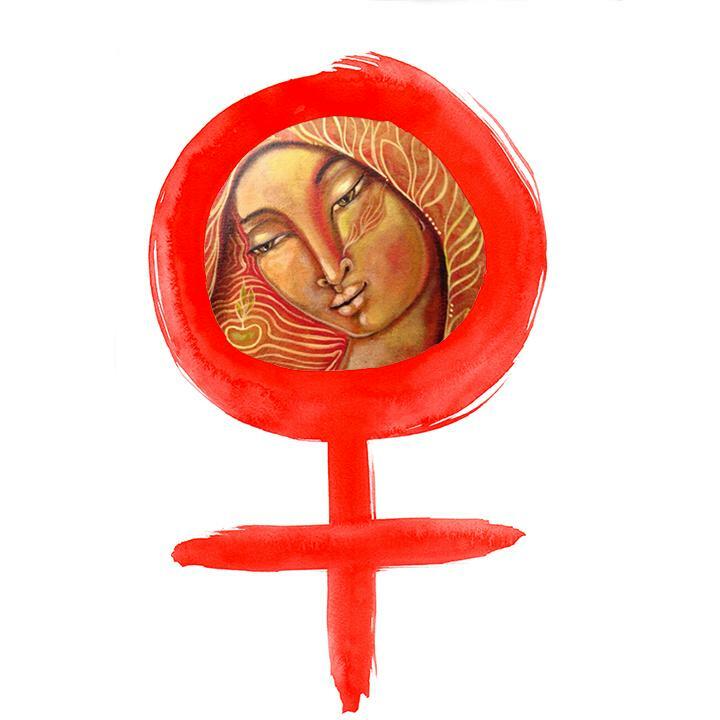 Thanks for your comment on my blog, and your permission. I love your Tuesday tea cups by the way. 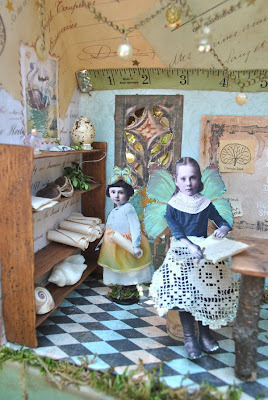 What a beautiful school house, it is the perfect place for faeries to learn their 3 R's!!!! 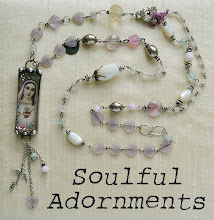 I can see that you enjoyed every minute that you were making this, it is truly full of soul! Terri, that is totally adorable!!! i love the pictures of Betsy checking it all out, she is such a cutie!!! Terri, this is just a total winner. So beautiful - and so detailed. I love the roof!!! 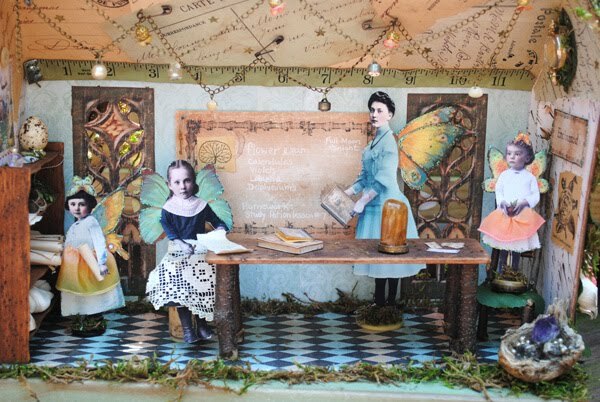 I wish I went to such a fanciful and creative school! I keep intending to get this book, and never remember. Maybe I should go order one from Amazon right now. This is absolutely darling!! I want to make one. I haven't had a chance to look at that book yet!! Is your Emma a cairn terrier? OH MY I just fell in LOVE! as a dollshouse enthusiast AND a papercrafter AND a girly-girl, this appeals on every level! it's an absolute delight, Terri, thank you for sharing. PS my 5 year old daughter WAAANTS ONE, MUM! 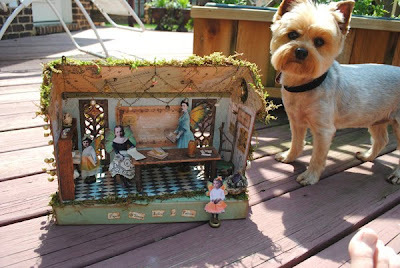 I'm not sure which is cuter the dollhouse or your adorable doggie! 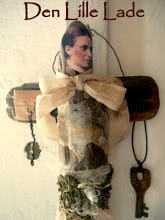 oh I have to make something like this!!! 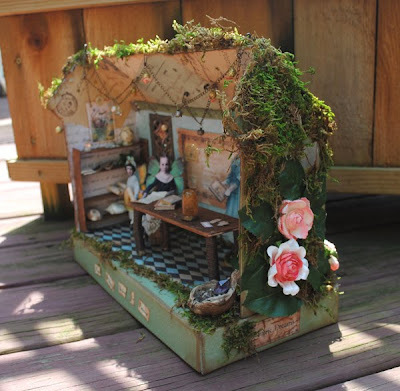 so cool with all the dimension....and I just adore doll houses...and your piece...I LOVE IT!!!! I am completely blown away! Your work is simply amazing. I think I am lost for words and that is very unusual for me!! Your little schoolhouse is wonderful beyond description - and I love inclusion of your tiny dog in some of the photos!! Hi Terri! What a gorgeous school! I am amazed by the amount of detail and creativity you put into this piece. Well done! Terri it is just wonderful!! I love the pics of your sweet baby checking to see what all the fuss is about!!! Thank you so much for coming over for a visit and taking the time to leave me a note. Take care!! Terri, I love this! I only recently read about this book that you've mentioned. It is obviously very inspiring, and it looks like your blog is too. I'm so glad that you dropped by mine, and led me here. Thank you. 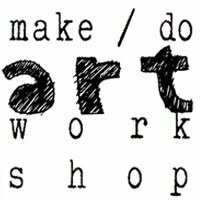 your mixed media creation is a marvel and a real work of art. 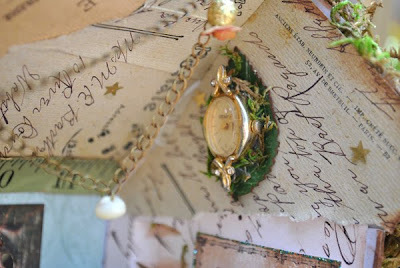 Love all those precious details: you're so crafty and talented. this is simply beautiful ... and whimsical and happy and free ... lovely! That is absolutely wonderful. It's the most beautiful school house I've ever seen! Love all the little details. I'm amazed! it's a very beutifull fairy school. you made it very sweet. Love all the details.I just keep looking! This is awesome. I have to get that book for sure. I love your blog and you little doggie. I have a yorkie also. I am going to follow you to see all of your beautiful creations. 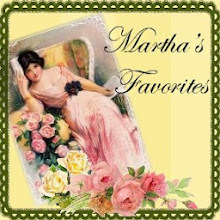 Come on over and visit when you have a chance. 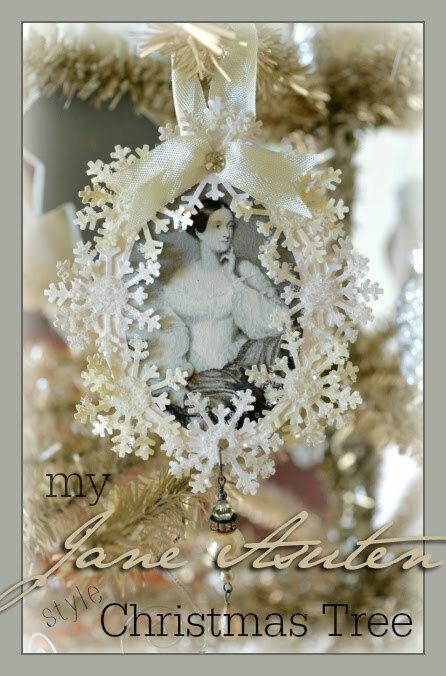 Oh my goodness, Terri, this is so gorgeous! I love all the sweet details. Just adorable! 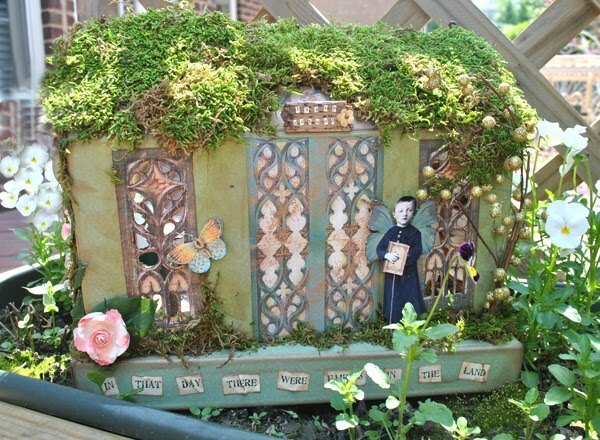 love love love the doll house! OHHHHHHH MYYYYYYYYYYYYYY, this is THE most wonderful house/room I have ever, ever seen. Did I say, EVER?! What a beautiful job with the details. You cannot possibly part with this. Oh, Terri, this is beautiful! I LOVE it! Your detailing is amazing, and there's so much to see. What a wonderful creation!! Terri, your room is incredibly beautiful! Great work! Thanks for coming by my blog too. Oh my this is so amazing! 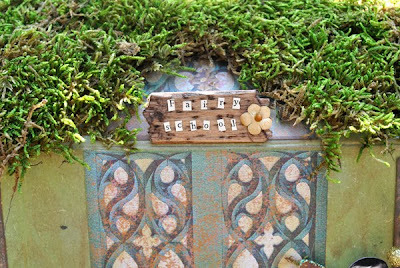 I love all the fabulous details - I must go back and inspect some more with my readers on - lol! 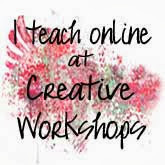 thank you so much for generously sharing your time and lovely creations! I very much look forward to making these lovely flowers! 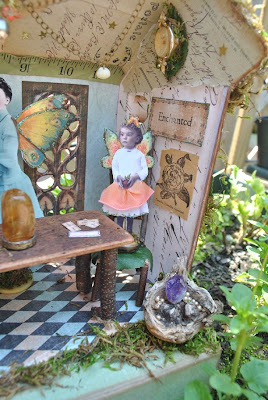 Terri your faire school is fabulous! What fun and inspiration.